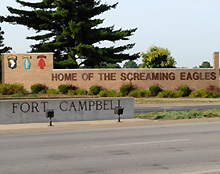 Fort Campbell is a "World Class Community" and is home of the Screaming Eagles, of the 101st Airborne – the Army’s only Air Assault Division. Fort Campbell lies on the Kentucky - Tennessee border between the towns of Hopkinsville Kentucky and Clarksville Tennessee. Clarksville, TN and Hopkinsville, KY are patriotic communities. American flags flying from many poles, and yellow ribbons serve as a reminders of those away defending our freedoms. As Fort Campbell Soldiers deploy and return from missions around the world, families, loved ones and the community greet them warmly.